The Tanium™ Core Platform is designed to optimize the network resources required to manage enterprise endpoints by distributing most of the data transmission among low latency, high-bandwidth local area network (LAN) links, thereby dramatically reducing utilization over the wide area network (WAN). For details about how Tanium Client peering works and related concepts, see Client peering. Always prevent client peering over the WAN. If you have a large subnet, you might want to expand the address boundaries that the AddressMask (IPv4) and AddressPrefixIPv6 settings define. However, be sure your changes do not cause unacceptable latency. Set the AddressMask and AddressPrefixIPv6 to the netmask/prefix of the biggest subnet in your network that you expect will not cross a WAN link. Use the separated subnets configuration to specify more granular exceptions to the AddressMask and AddressPrefixIPv6 boundaries. Use the isolated subnets configuration to specify the enterprise VPN subnet addresses. The best practice is for VPN clients to not participate in Tanium Client peering. Tanium Core Platform 7.2 and earlier supports only IPv4. If you need IPv6 support in version 7.3 or later, consult your TAM. Each Tanium Client can register with the Tanium Server as an IPv4 client or IPv6 client, but not both. Also, a Tanium deployment can include both IPv4 and IPv6 neighborhoods, but each neighborhood contains clients from only one IP version; IPv4 clients and IPv6 clients can never peer with each other. A Tanium Server setting that you configure in the Windows Registry (if the server runs on a Windows host) or in the TanOS console (if the server is a Tanium Appliance). AddressMask governs the network proximity of client peers with IPv4 addresses to prevent suboptimal peer connections. The default setting limits peering to neighbors that share the same 24-bit address mask. For example, a Tanium Client in subnet 192.168.0.0/24 can peer with other Tanium Clients in 192.168.0.0/24 but not those in 192.168.1.0/24. When Tanium Clients register with Tanium Server, the server sends it a list of neighbors to which the client can attempt to peer. The neighbor list adheres to the AddressMask boundary. On Tanium Server 7.3 or later running on a Windows host, this is a Tanium Server setting configured in the Windows Registry. AddressPrefixIPv6 governs the network proximity of client peers with IPv6 addresses to prevent suboptimal peer connections. The default is 0, which specifies no peering. Consult your TAM to determine the optimum value for peering in IPv6 networks. Otherwise, this setting functions the same as AddressMask. Double-click the AddressMask entry to edit it. Refer to Table 1 for guidance on specifying values. Double-click the AddressPrefixIPv6 entry to edit it. The following table summarizes IPv4 network address mask lengths for Class C and Class B addresses. AddressMask is a REG_DWORD type and is specified as a hexadecimal value. The convention dictates that the order of the octets in the mask is reversed in the Windows Registry key value, so FFFFFF00 (255.255.255.0) is specified as 00FFFFFF, and FFFFF000 (255.255.240.0) is specified as 00F0FFFF. ‡Enter eight zeros to disable the AddressMask setting. You would do this if you do not want to use AddressMask to limit peering. If you turn off AddressMask, there will be no default behavior, so you must explicitly account for all enterprise subnets in the SeparatedSubnets.txt file. Note that you must specify 00000000 and not just delete the registry key, or your changes will not persist across Tanium Server upgrades. If a registry entry named AddressMask does not exist, the upgrade process creates it with the default value (/24). Go to Configuration > Tanium Server > Subnets. Enter each Separated Subnet in CIDR format (such as 192.168.2.0/24). Tanium Core Platform 7.3 and later supports IPv6 subnets (consult your TAM), which you must enter within square brackets followed by the prefix (such as [2001:db8::]/32). Note:	Use either the ; or # character at the beginning of a line or immediately following an entry to add optional comments or documentation. Create a text file using a standard editor such as Notepad. Use either the ; or # character at the beginning of a line or immediately following an entry to add optional comments or documentation. Save the file with the name SeparatedSubnets.txt. Copy the file to the Tanium Server installation folder, including all Servers in an active-active cluster. 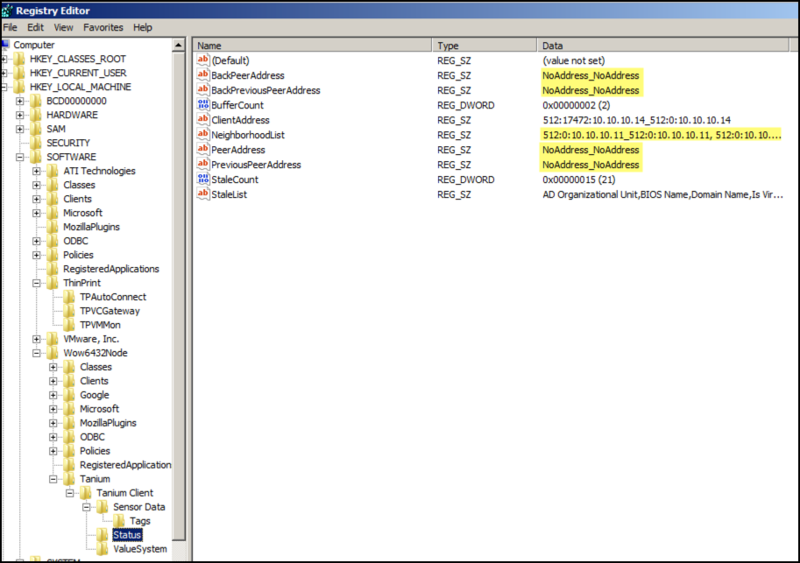 Copy the file to the Zone Server installation folder on any Zone Servers. The Zone Server uses the list to manage the peer list for Tanium Clients that register through it. The content of the SeparatedSubnets.txt files can differ between servers. Only the local file has effect. We recommend you keep the files in sync to avoid the potential for confusion. You do not have to restart the Tanium Server Windows Service. After you configure separated subnets, Tanium Clients can take up to four hours (the registration reset interval) to register with the Tanium Server and receive an updated peer list. As a best practice, do not enable Tanium Clients in virtual private networks (VPNs) to participate in client peering. VPN clients have local IP addresses in a special VPN address block, but their host endpoints are actually not close to each other. Network communication among them would use WAN links and have significantly greater latency than client-to-server connections. You can configure isolated subnets to disable client peering for a specified list of subnet and endpoint IP addresses. When a Tanium Client registers, the Tanium Server evaluates AddressMask, AddressPrefixIPv6, SeparatedSubnets.txt, and IsolatedSubnets.txt, and then applies the most restrictive rule among those settings. If a client IP address is in a subnet listed in IsolatedSubnets.txt, the Tanium Server sends that client an empty peer list so that the client does not participate in peering. After you configure isolated subnets, Tanium Clients can take up to four hours (the registration reset interval) to register with the Tanium Server and receive an updated peer list. If you install the Tanium Client on the Tanium Server host computer, it might be appropriate to add the CIDR IP address (such as 192.168.0.1/32) for that host computer to IsolatedSubnets.txt. When installed on the same host as the Tanium Server, the Tanium Client is designed to automatically listen for peer traffic on port 17473 instead of 17472. You might encounter issues during client peering activities, such as file distribution, if port 17473 is blocked. You might find it convenient to use isolated subnets to disable peering in other cases—for example, when testing or debugging peering when there are underlying network issues. Keep in mind that there are both performance costs associated with doing this (more client-server connections over the WAN) and issues with timeliness. For example, a Tanium Client that does not peer learns about new questions only at its registration interval—typically a number of minutes. As a result, isolated machines contribute answers more slowly than Tanium Clients that peer. If you use isolated subnets to disable peering, the best practice is to investigate the underlying network issues, resolve them, and then update the configuration so that the isolated clients resume peering. Enter each Isolated Subnet in CIDR format (such as 192.168.2.0/24). Tanium Core Platform 7.3 and later supports IPv6 subnets (consult your TAM), which you must enter within square brackets followed by the prefix (such as [2001:db8::]/32). Save the file with the name IsolatedSubnets.txt. Copy the file to the Tanium Server installation folder. In an active-active high availability deployment, do this for each Tanium Server. Copy the file to the Tanium Zone Server installation folder on any Zone Servers. The Zone Server uses the list to manage the peer list for Tanium Clients that register through it. The content of the IsolatedSubnets.txt files can differ between servers. Only the local file applies. As a best practice, keep the files synchronized to avoid potential confusion. You do not need to restart the Tanium Server Windows Service. You can verify changes using the Tanium Console or by examining the configuration on the client host computer. Tanium Clients receive updated peer lists during registration. Go to Administration > System Status to verify status is as expected considering the Last Registration date and time. You can sort the rows by Network Location and browse to review client peering status across subnets. The Status column indicates whether the client is a leader. A blank entry indicates a normal peer. You can use the Status column to track how your configuration changes affect leader count. The Direction column depicts client connection states. An up arrow indicates a connection with the Tanium Server. Side arrows indicate connections with peers. You can use the Direction column to understand the reasons the client is a leader. A client in the normal state, with backward peer and forward peer connections. A backward leader that marks one end of a linear chain. It typically has the lowest IP address in its linear chain. A forward leader that marks one end of a linear chain. It typically has the highest IP address in its linear chain. A client designated as a leader because its neighborhood has reached the maximum number of clients. An isolated client with no peer connections. In a test or small pilot deployment, you might notice what seems like an inordinate number of leader connections or unexpected leader connections. The platform performs more optimally with a minimum number of leaders, so it creates them when necessary. You can also use questions to verify expected behavior. The Initial Content pack includes sensors designed to examine the Tanium Client peer communication and neighborhood configuration. Sensors include: Tanium Client IP Address, Tanium Peer Address, Tanium Back Peer Address, and Tanium Client Neighborhood. The following example is an ad hoc question that uses these sensors. On an individual client, you can check the peer address lists in the Tanium Client settings. The following is an example of a Windows Registry for a Tanium Client that has peering disabled via the IsolatedSubnets.txt file. The following example shows the neighborhood and peering information in a TaniumClientStatus.ini file (Tanium Client 6.0). This client has no forward peer, so it is a forward leader. The following example shows the neighborhood and peering information in the Tanium Client database (Tanium Client 7.2 CLI).